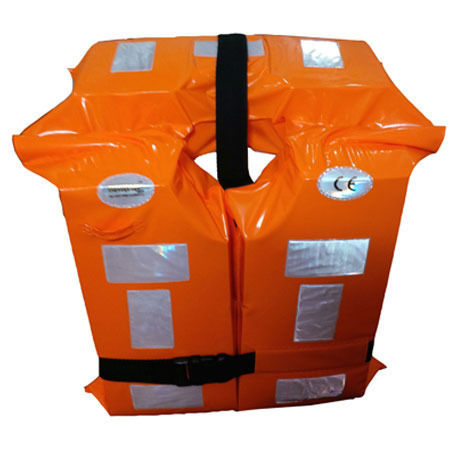 Designed for both pleasure boat and commercial applications, these high quality life buoy rings feature a bright orange cross linked polyethylene outer shell that will not rot or mould and is unaffected by extreme weather or prolonged outdoor exposure. Fully SOLAS / Ships Wheel approved and fitted as standard with 4 x SOLAS all-round Retro Reflective tapes and lifebuoy grab lines. Established in the year 2004, in Delhi, Karma Art is a leading Manufacturer and Supplier of a comprehensive array of all kind of Safety Products like Life jackets , Water Sports Life Jacket ,Safety X Belt, Wrist Band , Arm Band , Life buoy, Pvc apron and Reflective tags. Owing to our originality and rich experience in the industry that stretched back to over decade though our company founders, we provide our customers peace of mind that their safety standards on board vessels and offshore Rigs comply with international Classification Societies and Flags requirement. In addition to the Karma Art Service Workshop, our equipment's are procured from highly recognized manufactures, which have been in the industry for many years. We are able to service in others ports through our appointed agents worldwide. We are servicing customers 24 hours a day, 7 days a week throughout the major ports worldwide.